"Dharani" redirects here. For the Indian film director, see Dharani (director). For the film, see Dharani (film). For the Southeast Asian Buddhist goddess, see Phra Mae Thorani. A dhāraṇī is a Sanskrit term for a type of ritual speech similar to a mantra. The word dhāraṇī derives from a Sanskrit root √dhṛ meaning "to hold or maintain". Ryuichi Abe and Jan Nattier suggest that a dhāraṇī is generally understood as a mnemonic which encapsulates the meaning of a section or chapter of a sutra. Dhāraṇīs are also considered to protect the one who chants them from malign influences and calamities. The Japanese Buddhist monk Kūkai drew a distinction between dhāraṇī and mantra and used it as the basis of his theory of language. 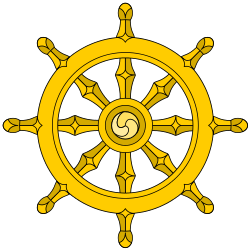 Kūkai claims that mantra is restricted to esoteric Buddhist practice whereas dhāraṇī is found in both esoteric and exoteric ritual. 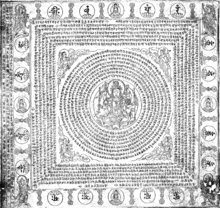 Kūkai classified mantras as a special class of dhāraṇīs and argued that every syllable of a dhāraṇī was a manifestation of the true nature of reality – in Buddhist terms, that all sound is a manifestation of śūnyatā or emptiness of self-nature. Thus, rather than being devoid of meaning, Kūkai suggests that dhāraṇīs are in fact saturated with meaning – every syllable is symbolic on multiple levels. According to Red Pine, mantra and dharani were originally interchangeable, but at some point dhāraṇī came to be used for meaningful, intelligible phrases, and mantra for syllabic formulae which are not meant to be understood. Jan Nattier writes that, whereas mantra has ancient Hindu usage back to the Vedas, dhāraṇī does not predate Buddhism. Buswell, Robert Jr; Lopez, Donald S. Jr., eds. (2013). Princeton Dictionary of Buddhism. Princeton, NJ: Princeton University Press. pp. 241–242. ISBN 9780691157863.